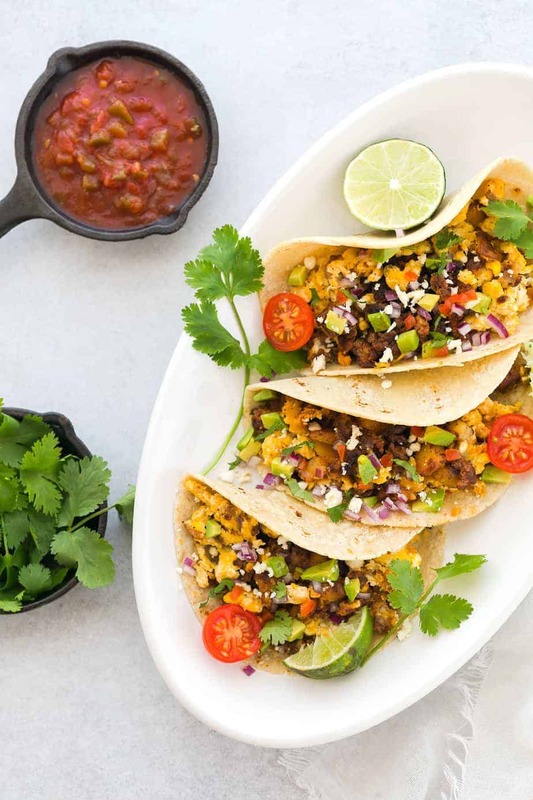 If you are looking for delicious easy breakfast recipes to make this upcoming week, check out these chorizo egg tacos. They are made of simple ingredients and are so quick to make, even on a hectic weekday morning! I served the chorizo eggs on store-bought corn tortillas, for those of you who have a little more time making them from scratch is always tastier. I purchased the chorizo from my local store. Since it has been previously seasoned and had the salt already added, I minimize the amount of extra seasoning during my prep and cooking. To make the cooking process go a little bit faster I cooked the potatoes in the microwave (with skin) for about 4-5 minutes. I have tried vegetarian chorizo as a meat alternative and some of the brands out there do a pretty good job. It all comes down to having the right mix of spices and whether they nail that authentic taste. You can find options in both tofu and tempeh varieties. Tofu as a whole is much more popular here in America but in Asia, there are a lot more tempeh dishes. I am personally a big fan of the harder consistency but it’s not for everyone. With the avocado and tomatoes, this dish is another healthy dish that I’m proud to share with you. For those of you on a health-watch you can of course use only the egg whites. With all of the other flavors going on here there’s no lack of taste so the yolks won’t be as missed as they are in some other dishes. I hope you enjoy this simple chorizo egg tacos recipe! 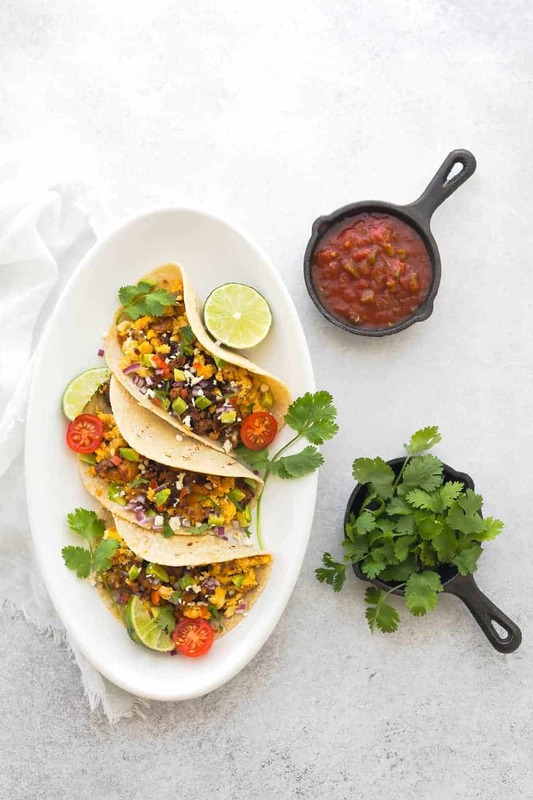 Also check out this easy vegan taco recipe and this fresh mango salsa recipe! Cook the potatoes in the microwave for about 4-5 minutes. Remove and let them cool down for about 5 minutes before cutting into small pieces. Heat 2 tablespoons of olive oil in a medium-to-large sized skillet. Add potatoes, then cook for about 2 minutes. Add salt/pepper to taste. Transfer to a plate. Heat 1 tablespoon of olive oil in the skillet. Add chorizo, then stir and break it into small pieces. Cook for about 4-5 minutes or until color indicates it’s fully cooked, and transfer to a plate. In a medium mixing bowl, beat eggs and milk with some salt and pepper. Heat 2 teaspoons of butter in a skillet until hot. Reduce the heat to low. Pour the egg mixture in. As eggs begin to set, gently pull the eggs with a spatula, then continue cooking and pull, lift and fold the eggs. Remove from the heat , transfer to a plate. Heat the tortilla in a skillet. Remove them and add generous amounts of chorizo, eggs, potatoes. Top with avocado, cilantro, tomatoes, Mexican cheese, salsa and red onion. We make our own chorizo and love it with eggs. Breakfast tacos is one of our favorite ways to eat chorizo so good. Looks like a fantastic dish! I haven’t tried chorizo before, but I’m always up to try something with flavor! Thanks for sharing! This looks like a great dish to prepare in the kitchen and try. Love to try this. Such another nice recipe. I need to do this as this is a healthy meal and easy to prepare dish. These sound amazing and with the addition of corn it sounds like a real treat! You had me at tacos! I absolutely love tacos! They are my favorite food and I am also a breakfast junkie, so I am definitely making these! For some reason I really love breakfast tacos. And these ones look amazing. I will have to try them out sometime. These chorizo egg tacos sounds so good. 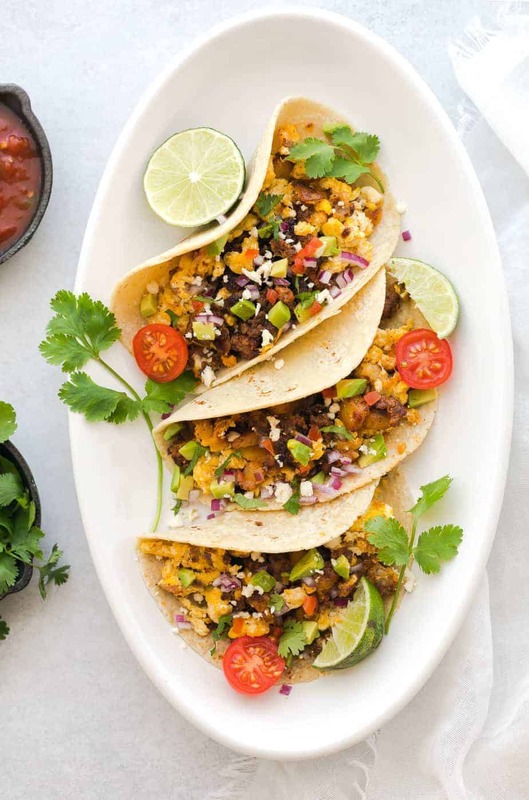 I have never thought to have a taco for breakfast but these look really good so I will have to make them. Thanks for sharing the recipe. I am not much of a taco person but I do eat every now and then. This looks so good. Wow these really look tasty! Can’t say I’ve ever had a Chorizo Egg taco but I do love tacos so this would be a fun try! This recipe looks so delicious. It looks so easy to make, I cant wait to try it. These sound amazing and so different!! Love the addition of corn!! These look so delicious! My other half would love these as he loves chorizo. I must give them a go.